It is not usually easy to identify Théodore Rousseau's landscapes, since the artist's concern was to depict not so much the place itself, as the deep feeling it conveyed. Nevertheless, in this case the plain of Montmartre, its hillsides and its mills can be clearly identified, as they can also be recognised in his painting View of the Plain of Montmartre. Storm Effect belonging to the collections of the Musée du Louvre (inv. RF 2053). As we can see, the artist proceeded in the same way in both paintings. The plain, in the centre of the landscape, is strongly lit by the sunrays; in the background, the hillsides of Montmartre, on which we can perceive the two famous mills, often represented in Georges Michel's paintings. Rousseau was not a painter of anecdotes. Ernest Chesneau wrote in 1880: "Man only takes up a small place in Rousseau's oeuvre; he only appears in his works as an accessory, an unimportant episode, disappearing and almost lost in the whole of the outside phenomena. Rousseau's paintings always leave an impression of solitude." The subject is understood and Rousseau's message is as clear as can be. Everything is placed in relation to the horizon line which divides the painting into two equal parts. 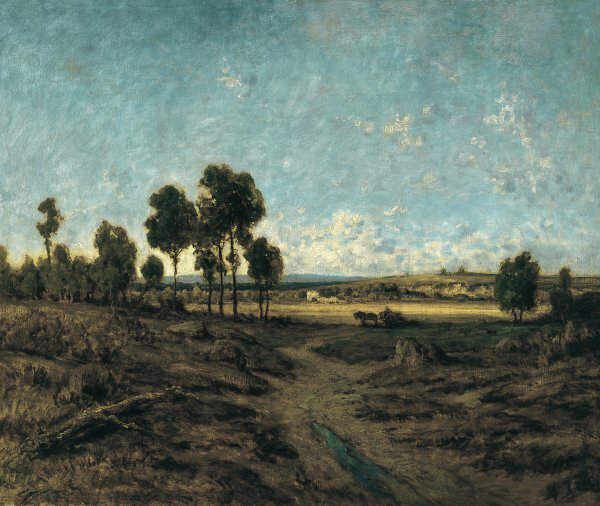 The same importance is given to the land and the sky, a clearly aesthetic and pictorial notion, but in Rousseau's case always tinted with spirituality. Rousseau often investigated colour, without ever quite mastering it, or at least ever feeling satisfied. For this reason he experimented continuously, he carried out attempts, which led him to the catastrophic use of bitumen. Here, we have the brown and ochre monochrome that dominates the foreground to give way, in the background, to a blue sky. The painter used the foreground, as the critics of the time wrote, as a "repoussoir." The tree is, all in all, the only link between land and sky, the roots of the known towards the unknown. If Rousseau is a master of the tree and occasionally of its detailed representation, sometimes he is only concerned with depicting its volume. But we should emphasise that, in this case, the tree does not play the important role the artist gives it in most of his paintings. Nevertheless, the painting as a whole has great originality.